So, you plan to build an offset smoker? Congrats! It’s a large undertaking, but fun and educational. This page is thought to be your guide when building your own offset smoker. I’m an advocate for what is commonly known as ‘fat-stack’ smokers. Being an engineer means calculating and measuring, instead of just guessing. A smoker needs to breathe properly. Below follows a detailed walkthrough of all parts of a smoker, regardless of whether it is a normal one or a reverse flow smoker. I discuss what you need to think of, and also what can be ignored. My aim is to take away some of the guesswork and myths when it comes to building offset smokers. This is my manifesto. 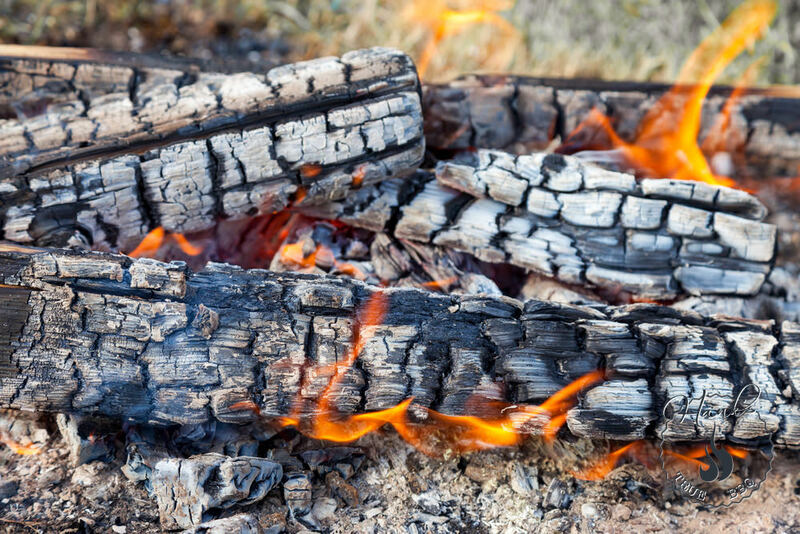 An offset smoker is typically using wood as a fuel source. 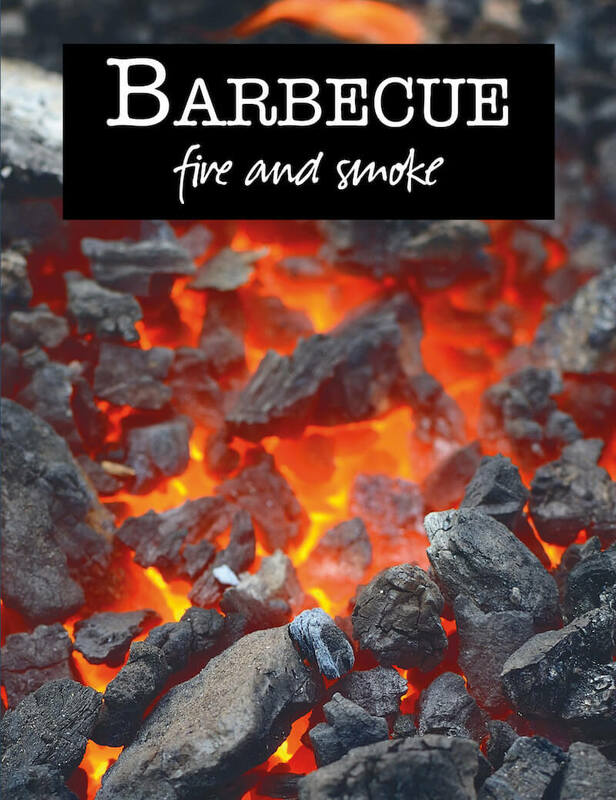 ‘Offset’ means the fire is offset, typically sideways, so you get the indirect heat setup that is key to barbecue. There are roughly two types of offset smokers. 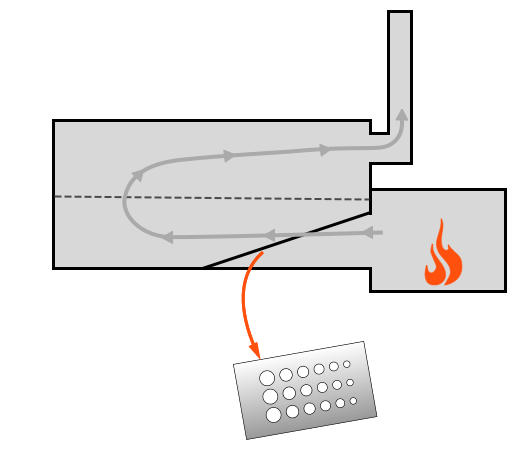 As you can see from the illustration above, the fire is in the firebox to the right. Hot air and smoke travels through the food chamber and out through the smoke stack. This is a ‘simple’ design that works well. Depending on how it is constructed it naturally runs hotter in the firebox end of the food chamber but this can be compensated for. 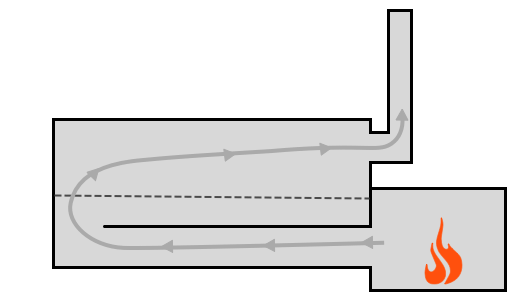 As illustrated the reverse flow smoker uses a long baffle to move air all the way through the food chamber before being turned around, or reversed. This helps even out temperature differences since the radiant heat from the baffle and food chamber walls heat up the air more evenly. The drawback is that air must travel longer, thereby potentially reducing draft if it isn’t dimensioned properly. The most obvious sign of a reverse flow offset smoker is the chimney being mounted on the same side as the firebox. 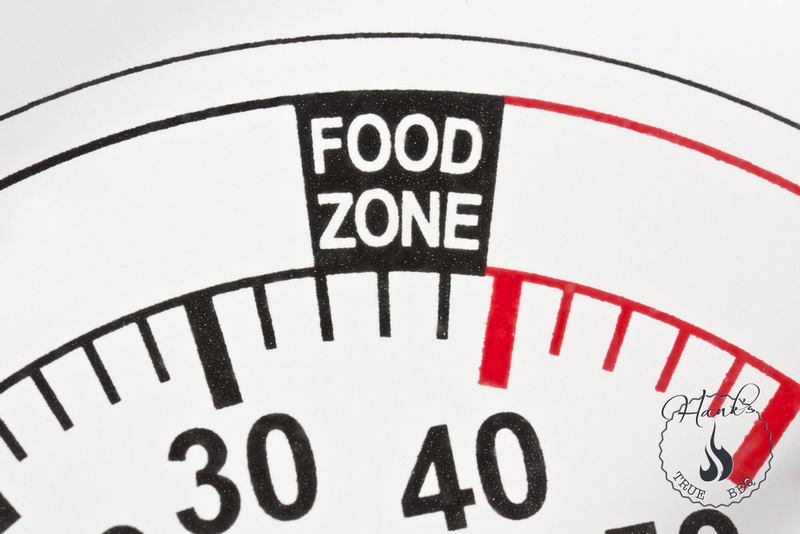 The main idea behind reverse flow is (as mentioned) to reduce temperature differences in the food chamber. Completely depending on different constructions an offset smoker is typically hotter the closer to the fire you get. A common way to solve this is to use a slanting baffle perforated with different size holes. See picture above. The hot air flow is slightly redirected by the smaller holes at the top, forcing some of the hot air down where the larger holes are. This distributes heat more evenly when it enters the food chamber. One must remember that air moves a lot faster through an offset smoker than in your ordinary kettle or kamado. If at all unsure of which to build, start with a normal offset smoker. NOTE: many first time builders I talk to have their mind set on building a reverse flow smoker since they just ‘know’ it is better. And that without even having used one, reverse flow or not. I think that is largely due to the many cheap offset smokers available on the market, which are badly designed and have large temp swings. A well constructed offset smoker has no issues with temp swings. My offset smoker ‘Rude Boy’ is a normal flow smoker, and I have a 5-8 degree temp variance in the food chamber. That is way less than most reverse flow smokers commercially available. Capacity. How much food do you need to cook at once? Appearance. What style of smoker are you looking for? Several grates at different levels are very common, as well as different door mechanisms. I usually measure briskets and ribs with a folding rule to be able to estimate shelf size. Make sure you measure height also to get a correct vertical distance between shelves. Regardless of size, two shelves/grates are recommended. Offset Smoker Food Chamber Shapes. The round one is most common. The firebox needs good oxygen supply, and should have room for building a good fire with 5-6 logs. The purpose of the firebox is to create a fire that can warm up and hold temp in the food chamber. The size of the firebox is not related to the size of the food chamber. Why not, you may ask? Well, the heat energy in burning wood is so high that even a 4-5 log fire can sustain temps in a 1000 gallon smoker. There are various suggestions online to make the firebox a certain percentage size of the food chamber, but that simply doesn’t hold true. Take a look at really large smokers like the ones Aaron Franklin buids, and there you will see the firebox is relatively small. In order for an offset smoker to work well you need a clean burning fire. A clean burning fire requires good draught, which is accomplished with an appropriately sized smoke stack. Many commercial smokers have a smoke stack that is too thin and/or too short if you ask me. The smoke stack is the engine in your smoker. By draught I mean the amount of air being pulled through the smoker, measured in ft3/s, or m3/s if you use the metric system. 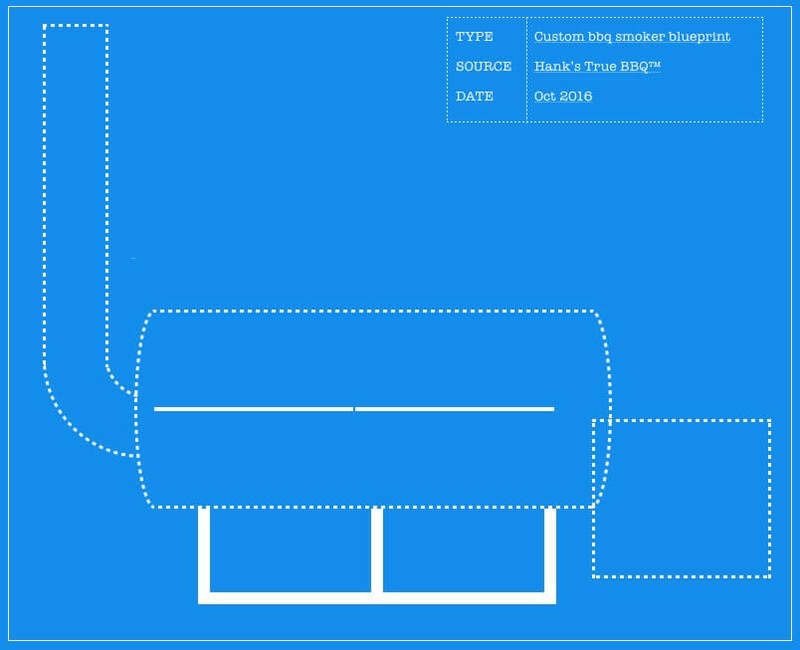 A common misconception online is that the smoke stack should be sized according to the size of the food chamber or fire box. This is wrong. The size of the smoke stack is governed by how much natural draught you want. Natural draught is controlled by the temperature difference between the food chamber and the outside air, nothing else. Most smoke stacks are located at the very top of one end of the food chamber. Some are centered vertically. Smoke Stack Placement: top, middle and bottom. Placement of the smoke stack is more important than you think. In an offset smoker there’s a lot of hot air moving through at a constant pace. Hot air rises, meaning it will move up to the top of the food chamber as it moves across. By placing the smoke stack lower down on the food chamber, the hot air flow will be temporarily reduced (when forced down), causing some of the hot air to transfer its heat back into the food chamber and therefore reduce the temperature differences. You can place the smoke stack even lower than that if you want to. See the image below which illustrates this back pressure. 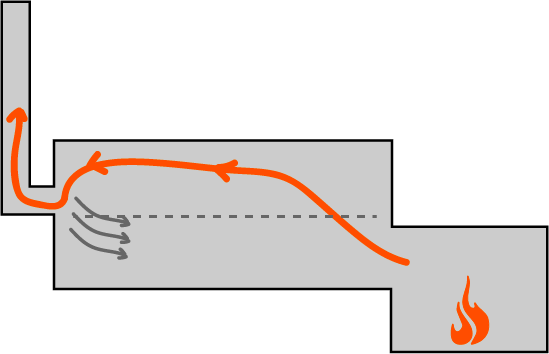 The aerodynamically oriented may wonder if the elbow or bend should be as smooth as possible to allow the smoker to breathe fully. You can use a 90 degree bend, or ‘soften’ it a bit in various ways. Does it really matter? 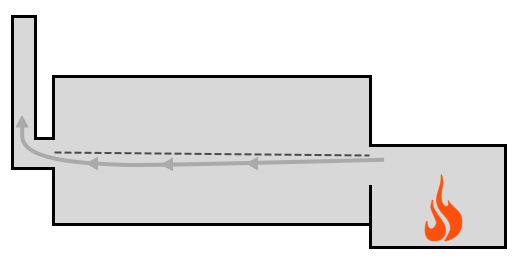 A 90 degree bend will affect draught slightly, but the effect is so small it can be ignored in this type of application. Choose what is easy to build or that matches the look you’re after. I bought a smoothly bent (1/4 circle) pipe myself, it was the easiest way for me. The opening from the firebox into the food chamber should be as large as, or bigger than, the smoke stack size. This is to avoid throttling the air flow.